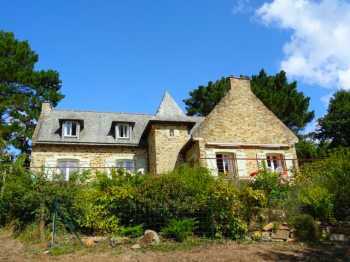 Unique, south facing, architecturally, traditional stone designed 217m2 house with panoramic views over the river Vilaine. Situated in the commune of Langon. If you are looking for peace and tranquility, fabulous views and within walking distance to the river Vilaine for walking and cycling, then this property is for you!, also has enough room for family and friends visiting and also with the opportunity to perhaps do a small BnB/chambres d'hotes or have a small appartement, just needs a small kitchenette to be installed. copper gutters and downpipes and a pretty tower. Entry through electronically controlled double gates, graveled drive to garage, parking for several cars. Entrance hall (2.7 x 3.3) with doors off to kitchen, receptions rooms, utility area, cloakroom. Kitchen (5.5 x 4): Range of modern fitted units, oven, microwave, induction hob,integrated fridge, dishwasher. Door to east terrace, and a communicating door to dining room. From hall glazed door to corridor leading to utility room (2.1 x 3.3) worktop with cupboards over, sink, plumbing for washing machine, vent for dryer, space for freezer. .
Cloakroom off entrance hall. WC and washbasin. Reception rooms: glazed double doors from entrance hall leading to:dining room (8 x 3.5), French windows to east terrace, pretty wooden staircase in tower to upper floor. Galleried balustrade overlooking sitting room. (6 x 4.4), a bright sunny room with four sets of French windows on three sides to lower south terrace. Woodburning stove in classic limestone fireplace. Oak beamed ceiling. Bedroom 1 (4.3 x 3.5) two double wardrobes, door through to en suite bathroom (3.3 x 3.1) with double basins, bath, bidet, wc, large shower, electric towel rail, extractor fan. French windows to terrace. Bedroom 5 currently used as an art studio (5.45 x 8.1 into eaves) , velux. Bedroom 4 (5.51 x 3.62 into eaves) large double wardrobe. From mezzanine door to corridor serving guest suite comprising shower room and bedrooms 2 and 3, :shower room (2.43 x 4.3) double basins, bidet, wc and shower. Bedroom 3 (3.3 x 4.3) with pretty river and garden views from south facing window. Bedroom 2 (3.5 x 6.65 into eaves) a large bedroom with pretty river and garden views from south facing window. West window and door to outside stone steps leading down to upper south terrace. As it has its own access, this guest suite could be turned into an entirely separate appartment, as could the master suite below. 4000 sq m gardens with commanding river views from both house and garden. Tiled terraces to east and south, secured by balustrades and linked by wooden steps and decking. Below the upper south terrace a pretty rose garden and shrubbery leading to a pergola. Below the lower south terrace a graveled area with raised fishpond and flower beds. From pond area gravel and oak steps through shrubs and flowerbeds to lawned garden, fir, oak, walnut and fruit trees, shrub borders, the whole being served by an automatic watering system running, in part, from recovered rainwater. Numerous outside taps. To the east second pond, vegetable area, potting shed etc. Below outside steps lean-to with outside tap, storage area. Open fronted woodstore. Broadband available, benefits from being on mains drainage! Walks directly from the property down to the river and along the riverbank/towpath for miles in both directions. the departement of Ille et Vilaine, bordering the Loire Atlantique.